It started as a nightly tradition while tucking in his three children. 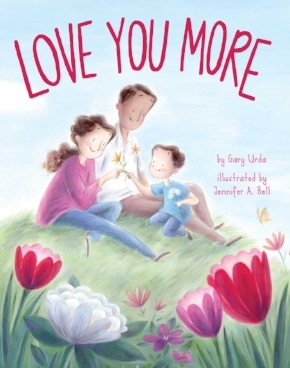 They would say “I love you” and Gary Urda told them, “I love you more.” That was the inspiration for his new children’s book, “Love You More”. As the nighttime ritual progressed, Urda added more details to his overflowing love and got creative with his sons, thinking of new ways to top the last time he told them he loved them. In his book, readers will get a glimpse into these special moments he shared with his children and understand the love a parent has for their child is “unconditional and unparalleled”. “I think it’s important that we find a way to let our kids know how much they mean to us, in a way that they understand,” Urda said. The book comes from an idea that circulated in his head for many months after his family brought back the tradition of telling each other, “I love you more…” as a reminder that they always care. What brought back this tradition and led to the loving book, was the tragedy of his middle son, Sean, passing in 2015. Even though this unfortunate event happened, what came out of it was a way for Urda to honor his family and the immense love they all share. When Urda finally went to put the words down on paper, they flowed out of him and only took a week to finish. Each page of the book begins with the phrase, “I love you more than…” and comes directly from words Urda said to his sons when they were younger. The first line of the book reads, “We thought we knew what true love was but then you came into our lives.” Urda feels this line will resonate with many parents as they read this book to their child, which is why he choose to make it a children’s book. “You think when you’re first married that you know what true love is, and then you have kids and learn what family love is and it’s completely different,” Urda said. Urda’s words are brought to life through fantastic and colorful illustrations, designed by Jennifer A. Bell. Although, he did not design them, he requested that his son, Sean, be honored by including his soccer jersey number in one of the illustrations. However when asked if he wanted the illustrations to be modeled after his family, he said no. He believes the family in the book could be any family and hopes families of all kinds can relate to it. The message he hopes to send is for parents to see how important it is for them to tell their children how much they love them, instead of just saying, “I love you”. “They taught me as a father what love really is and I owe that to all three of my boys,” Urda said. The book was published in August and can be purchased in hardcover for $17.99. Urda will be speaking and signing books at Barnes & Noble in East Northport on Saturday, Sept. 8, 12 p.m.